I was recently reading about non-coding RNAs being a counter example to Central Dogma of Biology. Can someone add more cases which violate the Central Dogma? Thanks! This states that once ‘information’ has passed into protein it cannot get out again. In more detail, the transfer of information from nucleic acid to nucleic acid, or from nucleic acid to protein may be possible, but transfer from protein to protein, or from protein to nucleic acid is impossible. Information means here the precise determination of sequence, either of basesin the nucleic acid or of amino acid residues in the protein. So, although in my comment I stated that the discovery of reverse transcriptase was the first violation of this — as was generally regarded — this turns out not to be the case. These diagrams ..., created originally by Crick, summarize the basic processes of information transfer within cells. And, so the central dogma has not been violated (certainly not by lncRNAs), unless you consider that it has by prions, where information of sorts is transfered from protein to protein. It’s amazing what you can find on the internet. Never believe what you find on the internet. 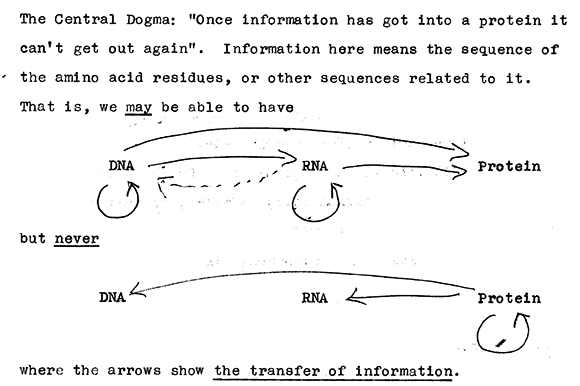 I’ve seen the DNA → Protein arrow repeated as if it were fact in diagrams, although Crick only said ‘may’. I know of no example of this. The "Central Dogma" is an obsolete concept. It has no biological significance today. It's been outdated for decades since the discovery of reverse transcriptase, but it was never intended to be taken particularly seriously anyway; Crick deliberately gave it its portentous name as a provocative approach, to drive people to think more about the topic and look for the counterexamples he presumed were there. Unfortunately, it seems that in some places -- notably India -- shoddy, ignorant teachers don't understand anything about modern biology and still believe that the Central Dogma has more than historical interest. It does not; it should not be taught in biology course, let alone treated as a testable concept, and any mention of it should be limited to History of Science courses. Because it is an outdated concept that no longer matches modern biology, and because these ignorant teachers still try to squeeze it into their courses and tests, many students (again, especially from India) are very confused, thinking that their understanding is wrong because it contradicts the Central Dogma. If you need to parrot something for an exam, I sympathize with you, but don't make the mistake of thinking that the Central Dogma is a real, relevant, modern biological concept. Examples that goes against this idea are Reverse transcriptase which transcribes RNA -> DNA. Reverse transcriptase was originally found in RNA viruses. But has since been found in transposons which can be though of viruses that permanently resides in the host cell. RNA dependent RNA polymerase RNA-> RNA (No DNA is required to make more RNA). has been found in yeast.. with the role of maintaining the centromere... and likely will be found in humans too, since centromeric structure is believed to be conserved in the broad sense. There is also histone modification.. which can be inheritable depending on gene. But it is regulation of DNA by controlling how available that DNA is to being read by transcription machinery. Then there is siRNA... which can and does modify gene activity. A weaker example of how information can flow from RNA -> DNA. Next are proteins called cytidine deaminases. These proteins naturally convert cytidine to uracil. APOBEC modifies RNA.. creating a premature stop and thus a shorter APO-B protein with lower activity.. regulating lipid metabolism. So mRNA editing by APOBEC proteins changing the information in RNA aka Protein -> RNA. Next is AID, another cytidine deaminase but one that targets DNA. It used by the immune system to cause hypermutation and thus variation in the antibodies. A poor example of protein inducing genetic changes. Not controlled unlike the DNA methylation example. Lastly there are ribozymes. RNA that have catalytic activity. So no need for the protein to catalyses a reaction.. RNA can do it on its own. Not the answer you're looking for? Browse other questions tagged genetics molecular-biology philosophy-of-science or ask your own question. Is there any reason an arbitrary DNA sequence such as 5'-ACACACACAC-3' would not exist in nature?